Is Žižek a bogus Marxist? Socialist Fight recently writes "Slavoj Žižek, a bogus Marxist who counterposes “authentic emancipatory politics” to imperialist barbarism"
On 8 May 2014 Slavoj Žižek published an article in the London Review of Books, Barbarism with a Human Face: Lenin v. Stalin in Kiev. It was a sophisticated attack on Marxism by using some correct arguments to make the reactionary, pro-imperialist points in the last paragraphs. This piece had as its purpose the defence of the Maidan coup in Kiev of February 2014, the rubbishing of the struggle against it by the people in Eastern Ukraine and portraying of Russia and Vladimir Putin as the main enemy. But before we go into the details of that it is necessary to take a brief look at the Žižek’s political character and his social values to assess the quality of his Marxism. “their reading of Lacan via German Idealism and German Idealism via Lacan risks transforming Lacanian psychoanalysis into a discourse of self-consciousness rather than a discourse on the psychoanalytic, Freudian unconscious. In this manner, the very scandalous rupture that Freudian and Lacanian psychoanalysis affected in thought and in culture (that it thinks without and for me) is in jeopardy of being foreclosed through a return to German Idealism’s discourse of self-consciousness. Here, Lacan functions as a screen in order to rehabilitate the theses of German Idealism that psychoanalysis itself put into question. The spokesperson for the Turkish presidency, Ibrahim Kalin writes on Zizek's analysis on Turkey on the Al-Jazeera English. In his criticism and eventual rejection of all the major methods used in the natural sciences, Paul Feyerabend had said that the only principle that allows progress in science is "anything goes". Anything that gets the job done is welcome, he may have added. The motto became one of the defining elements of post-modernity: what defines things is not reason, truth, tradition or coherence but whatever you come up with as your version of reality. While this anti-realist rule of postmodernism has lost much of its elan now, its frivolous voice pops up here and there. It looks as if the debate about Turkey among some Western liberal and leftist authors is underlined by a similar "anything goes" frivolity. Slavoj Zizek's short piece on Turkey published in the New Statesman on December 9 is a case in point. Zizek claims that "the so-called 'war on terror' has become a clash within each civilisation, in which every side pretends to fight [ISIL] in order to hit its true enemy". This is probably the only meaningful sentence in his piece that borders on frivolity and bigotry. Zizek accuses Turkey of supporting the Islamic State of Iraq and the Levant (ISIL), treating its injured militants, facilitating its oil go through Turkish territories and even insinuates that Turkey shot down the Russian warplane on November 24 because it was bombing ISIL targets. He then continues with his ranting against the European Union for agreeing to pay 3bn euros ($3.3bn) to Turkey for the Syrian refugees. Zizek not only works on a fallacious logic but more alarmingly fails to get his facts right. He uses made-up stories spread by Iranian and Russian propaganda websites to attack Turkey. His "sources", including AWD News, are so false and so poorly selected that the editors of the New Statesman had to remove part of the piece in which Zizek attributed a totally false statement to Hakan Fidan, the head of Turkish intelligence. His claim that Russia bombs ISIL targets along the Turkish-Syrian border has been disproved many times by all as credible sources. In fact, since it started its air campaign, 90 percent of Russian air strikes have targeted Syrian opposition groups and civilians who have nothing to do with ISIL. There are no ISIL terrorists in the Turkmendagi-Jisr al-Shughr-Idlib area, and the number of civilian deaths under Russian bombardment has exceeded 700 so far. If Zizek cares, I will be happy to send him a map of Syria showing Russian bombings so that he can at least get his facts right about one thing. The PKK is trying to conceal its terror crimes on the pretext of fighting ISIL. The fact is that Turkey does not bomb any Kurdish targets in Syria. It only goes after the PKK terrorists that put Turkish and Kurdish lives in danger. Zizek's false claims about Turkey's discreet help to ISIL are a regurgitation of cliches uttered by Moscow these days. The funny thing is that Zizek - otherwise a staunch opponent of the Russian propaganda - takes sides with it when it comes to attacking Turkey. Slavoj Žižek about "the real reasons for flight and terror"
The Slovenian philosopher and cultural critic Slavoj Žižek is currently one of the stars at the sky thinkers - even or especially because his often unorthodox theories and links polarize strongly.His readings are sold out, asked his books. His current manifesto comes with a fist. "The new class struggle - the real reasons for flight and terror." A pithy title - matches started. Revolutionary Sturmschritt - one who has always in a hurry, a raging, one who wants to tell us in his own way, why he does not want military intervention in Syria: "Why do we bomb Syria We should instead massive pressure on? Turkey and Saudi Arabia make because everyone knows:. As soon as Turkey and Saudi Arabia end their support for the IS, the IS would collapse in a month or two "
Does it be because of a too easy? 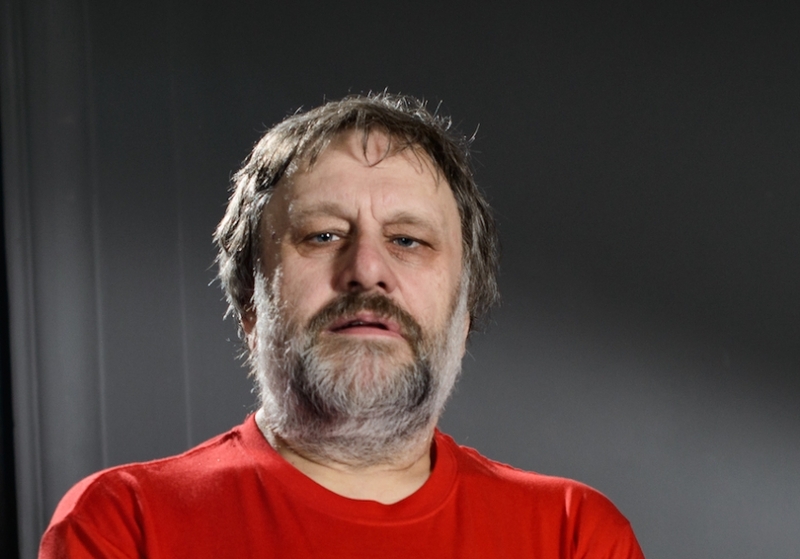 Žižek know that it provokes, but a fundamental problem on the professor of philosophy indicating his students is his concern and deadly serious. Žižek warns against a out of control geratenen capitalism, the whole country, destroy terror, war and misery bring. And not only the current flow of refugees to Europe - Here Žižek not only the terror of Paris has in view. He wants to know why more than 50 million people worldwide are on the run, why states and whole regions in war, anarchy and terror sink. Why the world is falling apart. 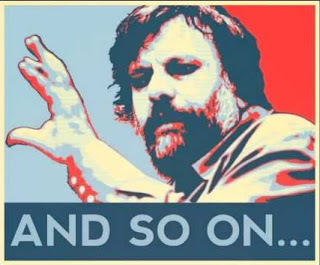 For Žižek has all that a common economic plan: an unleashed form of capitalism, which knows no rules and no social standards: "Capitalism - and I do not mean a few bad guys, I mean the system - this capitalism has in a way altered, where he no longer redeem its own promise of freedom. Today's capitalism is undemocratic and does in this form in Europe wide." 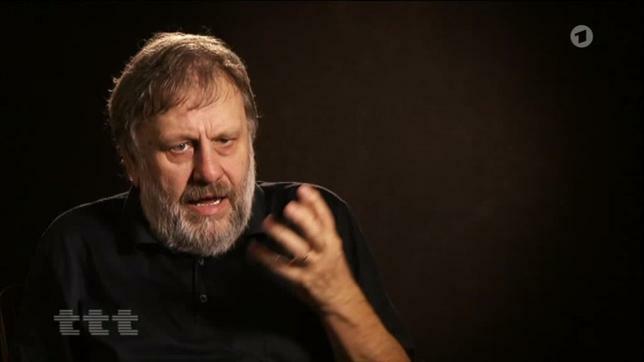 With his polemic Slavoj Žižek has tried to write a kind of "political economy" of escape and terrorist crisis. For him, the problem is the dynamics of "neoliberal" capitalism, as she describes, for example, the film "Let's Make Money" in impressive pictures. It is this relentless race for the cheapest labor and raw materials. An inhuman exploitation logic that knows no morality and no limits. "Congo is for me an example of what I mean:.. The Congo has ceased to function, it is probably the most violent country in the world - but perfectly integrated in global capitalism, the warlords there make excellent commodity transactions with western high-tech -companies "says Zizek. Žižek concludes: Who wants to prevent anarchy and terror, should be less thinking about military operations, but rather about how a truly fair world trade could look - a more humane form of capitalism: "I do not think that we are hoping for a new communist revolution should. Globalized capitalism itself is not uniform but economy, but in itself is full of contradictions and varieties. But this also gives us room and freedom for change." About two varieties of capitalism, however, Žižek draws clear to war: against the fundamental market radicalism "made in USA" and against an authoritarian capitalism Asian structured embossing. Both antidemocratic, so his analysis. And precisely why Europe should be stand up for European values, once won by the French Revolution: the social market economy: "On the universal level, we should emphasize that the United States are important partners and our friends are, but on a practical level, we should eg TTIP and much, much reject others, "says Zizek. Žižek wants us away from the thesis of the "clash between religions and cultures". He fights for his belief that the real reason behind it lie - that there are economic interests that lead to war and terror, which is why our problems are peacefully resolve. His fans love him for that message. 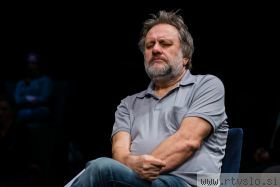 Jamil Khader in defense of Slavoj Žižek: Rejoinders to Slavoj Zizek’s polemic on the refugee crisis insist on turning this exchange into Zizek’s Heideggerian moment. His interlocutors find his putatively racist and xenophobic claims about refugees and their cultural traditions to be reckless, irresponsible and inconsistent with his self-professed radical egalitarian politics. 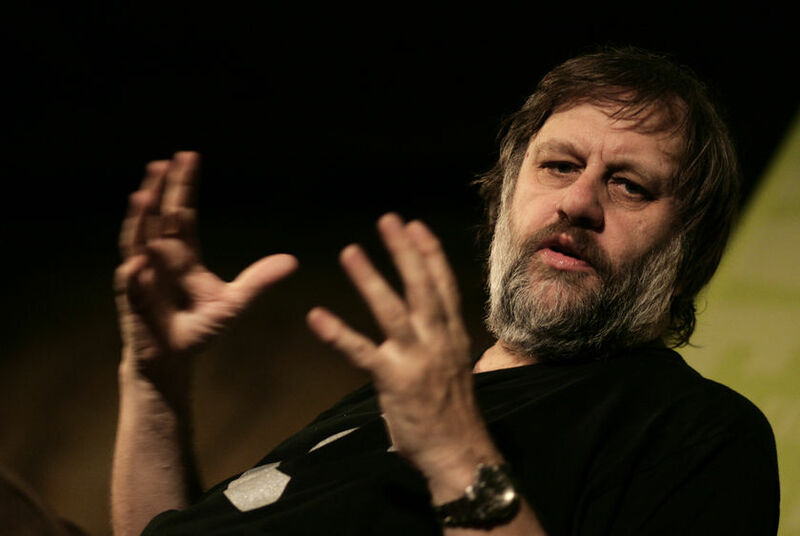 The problem in the critical reception of his polemic on the refugees is not so much, as Kotsko maintains, that Zizek over-identifies with the “(inadequate) terms of the public debate.” Rather, Zizek’s problematization of the presuppositions inherent to both Western liberal multicultural and populist, anti-immigrant, neofascist discourses on the refugees are mistaken for his own position on the politically correct and postmodern taboos that he opposes. These presuppositions, however, are clearly distinct from his position on the taboos. The three main presuppositions that Zizek engages in this polemic, and the PC taboos that are related to them, include the following: First, the slippage between refugees and Islamic terrorists, by which racist discourses seem to suggest that the refugees are somehow ISIS terrorists who were transplanted into Europe directly from some ISIS’s terrorism training camps. The corresponding PC and postmodern taboo that Zizek forcefully disavows is the taboo about demonizing the ISIS terrorists—those who enforce this taboo tend to subjectivize the terrorists, with the intention of offering a “deeper understanding” of their humanity in their struggle against Western colonial interventions. For Zizek, there should be no sympathy for the terrorist Other. What is Islam - this disturbing, radical excess that represents the East to the West, and the West to the East? Let me begin with the relationship of Islam to Judaism and Christianity, the two other religions of the book. As the religion of genealogy, of the succession of generations, Judaism is the patriarchal religion par excellence. In Christianity, when the Son dies on the cross, the Father also dies (as Hegel maintained) - which is to say, the patriarchal order as such dies. Hence, the advent of the Holy Spirit introduces a post-paternal/familial community. In contrast to both Judaism and Christianity, Islam excludes God from the domain of the patriarchal logic. Allah is not a father, not even a symbolic one. Rather, God is one - he is neither born nor does he give birth to creatures. This is why there is no place for a Holy Family in Islam. This is why Islam so emphasizes the fact that Muhammad himself was an orphan. This is why, in Islam, God intervenes precisely at the moments of the suspension or failure of the paternal function (when the mother or the child are abandoned by the biological father). This is also why Islam represented such a problem for Freud: his entire theory of religion is based on the connection between God and "the father." But even more importantly, it is this that inscribes politics into the very heart of Islam, since the "genealogical desert" makes it impossible to ground a community in the structures of parenthood or other blood-ties. As Fethi Benslama puts it, "the desert between God and Father is the place where the political institutes itself." In Islam, it is no longer possible to ground a community in the mode of Totem and Taboo, through the murder of the father and the ensuing guilt which brings brothers together - hence Islam's unexpected actuality. This problem is at the heart of the Muslim "community of believers" - the Umma - and accounts for the overlapping of the religious and the political (the community should be grounded directly in God's word), as well as for the fact that Islam is at its best when it grounds the formation of a community "out of nowhere," in the genealogical desert, as a kind of egalitarian revolutionary fraternity. No wonder, then, that Islam is so appealing to young men who find themselves deprived of family and social networks. "The distinctive mark of Islam is that it is a religion which did not institutionalize itself; it did not , like Christianity, equip itself with a Church. The Islamic Church is in fact the Islamic State: it is the state which invented the so called 'highest religious authority' and it is the head of state who appoints the man to occupy that office; it is the state that builds the great mosques, that supervises religious education; it is the state again that creates the universities, exercises censorship in all the fields of culture, and considers itself as the guardian of morality." Here we can see how the best and the worst are combined in Islam. It is precisely because Islam lacks an inherent principle of institutionalization that it has proven so vulnerable to being co-opted by state power. Therein resides the choice that confronts Islam: direct "politicization" is inscribed into its very nature, and this overlapping of the religious and the political can either be achieved in the guise of the statist co-option, or in the guise of anti-statistcollectives. But let me now move to a further key distinction between Judaism (along with its Christian continuation) and Islam. As is apparent from the account of Abraham's two sons, Judaism chooses Abraham as the symbolic father; Islam, on the contrary, opts for the lineage of Hagar, for Abraham as the biological father, thereby maintaining the distance between "the father" and God, and retaining God in the domain of the un-symbolisable. It is nonetheless significant that both Judaism and Islam repress their founding gestures. According to Freud's hypothesis, repression in Judaism stems from the fact that Abraham was not a Jew at all, but an Egyptian - it is thus the founding paternal figure, the one who brings revelation and establishes the covenant with God, that has to come from the outside. In Islam, however, the repression concerns a woman - Hagar, the Egyptian slave who bore Abraham his first son. For although Abraham and Ishmael (the progenitor of all Arabs, according to the myth) are mentioned dozens of times in Qur'an, Hagar is entirely absent, erased from the official history. As such, she continues to haunt Islam, her traces surviving in rituals, like the obligation of the pilgrims to Mecca to run six times between the two hills Safa and Marwah - a kind of neurotic re-enactment of Hagar's desperate search for water for her son in the desert. But along with Hagar, there is in the pre-history of Islam the story of Khadija, the first wife of Muhammad himself, who enabled him to differentiate between truth and falsehood, between angelic messages and those from demons. These squares are outwardly similar to existing squares and yet we have never seen them…we are in an immense previously inconceivable world. At nineteen, it is easy to think that all you’re missing is the right movement. But there is something about the young left wing societies I talk with that properly gets under my skin. I don’t like the sweaty red t-shirts and the sweaty red pamphlets. I don’t like the theatrical way the guy from my linguistics lecture puffs himself up at a march, carefully smoking American Spirit. A reflexive nostalgia often seems to govern these movements and sometimes I swear the party shirts are only there to accessorise a Facebook album with a sepia tint. Slavoj Žižek recently spoke at the London Literature Festival. He talked about true freedom and where it lies; about whether it has become an impossible dream. Stretching a tightrope in between the poles of John Gray and Francis Fukuyama, he explored the tension. How free, he asked, is the current system? He nearly sold out the Royal Festival Hall. The crowd was mainly my age, with a lot of guys sporting good cheekbones who didn’t take off their coats before sitting down. 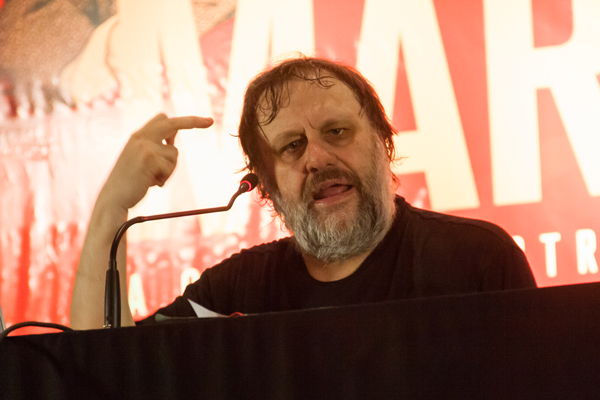 Žižek is often dismissed. A big personality, he can come off as a clown, advocating a utopia he cannot define. Benjamin Kunkel noted that, since 1991, the greatest challenge to the would-be revolutionary left has been the fact that they can demonstrate “…neither a serious strategy for the conquest of power nor a programme to implement, should power be won.” This is not a new anxiety, but it gets at why Žižek is relevant to the young left today. 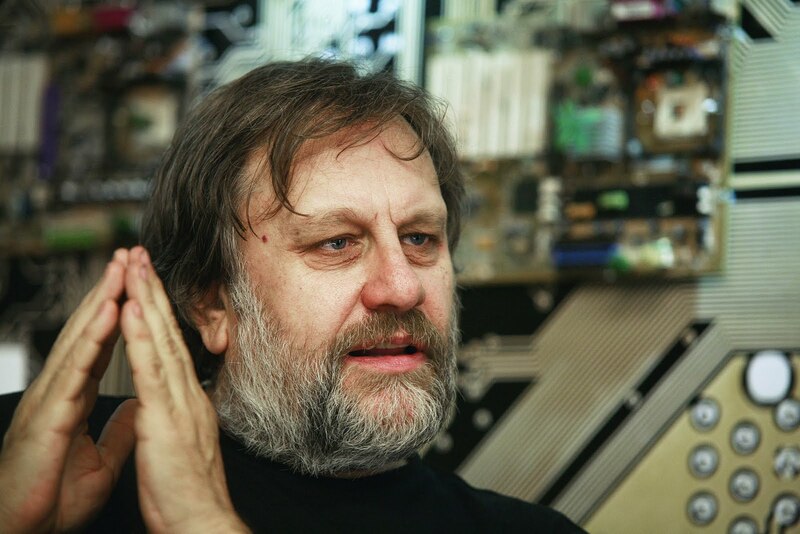 I don’t believe we are able to look to Žižek to tell us where a revolution should lead. What he can give us is something more concrete than that. He says things that can be held onto in the world of exam preparation and career prospecting. He says things that feel like the intimations of a strategy. It’s a message, from someone who has pored over revolutions, to those people, like myself, who are agitated by the apparent immutability of the current economic system. According to Žižek, the pivotal question of his speech was: ‘Are you a Fukuyamist?’ Even Fukuyama says he can no longer justify his position as a Fukuyamist, but what we can justify need not correspond with how we believe. Global capitalism’s greatest art is its ability to tranquillise us with the belief that we exist at the culmination of civilisation.